The pathogenesis of HIV-1 glycoprotein 120 (gp120) associated neuroglial toxicity remains unresolved, but oxidative injury has been widely implicated as a contributing factor. In previous studies, exposure of primary human central nervous system tissue cultures to gp120 led to a simplification of neuronal dendritic elements as well as astrocytic hypertrophy and hyperplasia; neuropathological features of HIV-1-associated dementia. Gp120 and proinflammatory cytokines upregulate inducible nitric oxide synthase (iNOS), an important source of nitric oxide (NO) and nitrosative stress. Because ascorbate scavenges reactive nitrogen and oxygen species, we studied the effect of ascorbate supplementation on iNOS expression as well as the neuronal and glial structural changes associated with gp120 exposure. Human CNS cultures were derived from 16–18 week gestation post-mortem fetal brain. Cultures were incubated with 400 μM ascorbate-2-O-phosphate (Asc-p) or vehicle for 18 hours then exposed to 1 nM gp120 for 24 hours. The expression of iNOS and neuronal (MAP2) and astrocytic (GFAP) structural proteins was examined by immunohistochemistry and immunofluorescence using confocal scanning laser microscopy (CSLM). Following gp120 exposure iNOS was markedly upregulated from undetectable levels at baseline. Double label CSLM studies revealed astrocytes to be the prime source of iNOS with rare neurons expressing iNOS. This upregulation was attenuated by the preincubation with Asc-p, which raised the intracellular concentration of ascorbate. Astrocytic hypertrophy and neuronal injury caused by gp120 were also prevented by preincubation with ascorbate. Ascorbate supplementation prevents the deleterious upregulation of iNOS and associated neuronal and astrocytic protein expression and structural changes caused by gp120 in human brain cell cultures. Patients with HIV-1/AIDS have a high frequency of neurological complications during the course of infection [1, 2]. These complications include opportunistic infections and neoplasms. HIV-1-associated dementia (HAD) is a common neurodegenerative disease in AIDS and occurs independent of opportunistic infections or neoplasms . HIV-1 associated dementia is associated with HIV-1 encephalitis and a high brain viral burden. [4, 5]. The pathological hallmarks of HIV-1 encephalitis include reactive astrocytosis, myelin pallor and the presence of multinucleated giant cells [6–8]. Recent evidence suggests that pruning of neuronal dendrites and synaptic contacts are correlates of dementia [8, 9]. Other studies have demonstrated a correlation between neuronal loss and dementia . HIV-1 enters the brain early, within days of the initial viremia. The virus gains access via CD4+ macrophages , which migrate across the blood-brain barrier. The infection then spreads to neighbouring microglia, the only host to productive infection in the brain. Most evidence points to the main pathway of neuronal injury as being indirect, through the release of toxins by activated microglia and astrocytes. [7, 11]. Factors such as cytokines and shed viral proteins such as glycoprotein 120, released by infected cells, can further activate microglia and astrocytes. Glycoprotein 120 (gp120) is the HIV-1 surface glycoprotein responsible in part for HIV-1 binding to target cells and is implicated as a causative factor in AIDS-related neurotoxicity [12–14]. Very high concentrations of gp120 are required for direct neuronal injury, much higher than the actual levels of the protein believed to be present in vivo, lending further support to the theory that the neurotoxicity of gp120 is largely indirect . Moreover in HAD, apoptotic neurons do not co-localize with infected microglia. , further implicating a multicellular pathogenesis. Macrophage and astrocyte activation results in elevated levels of proinflammatory cytokines, chemokines and endothelial adhesion molecules. Activated microglia also release glutamate and other excitatory amino acids such as quinolate and cystine [16, 17]. Overstimulation of glutamate receptors leads to excessive calcium influx and to the formation of free radicals such as nitric oxide (NO) in neurons and astrocytes . Nitric oxide is produced from the conversion of L-arginine to L-citrulline by nitric oxide synthases (NOS) and is involved in a number of vital physiological processes including vasodilation and neurotransmission . There are three isoforms of the NOS enzyme; inducible NOS (iNOS), endothelial NOS (eNOS), and neuronal NOS (nNOS). Both the neuronal and endothelial isoforms of NOS are activated by calcium and calmodulin . However, iNOS activity is independent of calcium. Moreover, iNOS can produce greater amounts of NO (μM rather than pM produced by the constitutively expressed isoforms). Nitric oxide combines with the superoxide anion to form the neurotoxic oxidant, peroxynitrite. Peroxynitrite and other reactive oxygen species are scavenged by low molecular weight reductants such as ascorbate but nitrosative stress occurs when these reductants have been depleted . Nitric oxide can also bind to cytochrome oxidase, the terminal complex of the mitochondrial respiratory transport chain . By competing with O2, NO reversibly inhibits cytochrome oxidase, prevents cellular respiration and may lead to the increased generation of superoxide anion and peroxynitrite . Furthermore, inhibition of mitochondrial oxygen uptake leads to elevation of cytosolic calcium. It has been suggested that the elevation of cytosolic calcium facilitates mitochondrial transition pore opening and the release of pro-apoptotic proteins . Other authors have provided evidence that nitric oxide may mediate cytotoxicity through a number of other pathways including DNA damage and activation of poly (ADP-ribose) polymerase [24–28]. Previous studies have demonstrated fragmentation, vacuolation, varicosities, and pruning of neuronal dendrites following exposure of primary mixed CNS cultures to gp120 (Iskander et al. : Human CNS cultures exposed to HIV-1 gp120 reproduce dendritic injuries of HIV-1-associated dementia. J Neuroinflammin, 2004, 1:7). These neuronal injuries were accompanied by astrocytic hypertrophy and hyperplasia, which is consistent with neuropathological observations in HAD. [7, 29–31]. The relevance of iNOS following gp120 exposure comes in part from studies that have shown that inhibitors of iNOS mitigate some of the effects of gp120. Many studies have reported increased plasma cortisol levels in HIV-1 patients, in correlation with the clinical progression of the disease . It was demonstrated that gp120 is able to activate the hypothalamic-pituitary-adrenal axis through the release of corticotropin releasing factor (CRF) . However, in the presence of a nonselective NOS inhibitor, L-NAME, gp120 exposure was no longer sufficient to induce CRF production . Moreover, an upregulation of membrane CD23 protein was detected in primary human astrocyte cultures exposed to gp120. This upregulation resulted in the production of NO and interleukin-1-beta (IL-1β), which was prevented with the use of the iNOS inhibitor, aminoguanidine . Glutamate receptor antagonists, NOS inhibitors, and superoxide dismutase have also been shown to protect primary neuronal cultures from gp120 . Highly active antiretroviral therapy (HAART) has met with success in the treatment of HIV-1/AIDS, yet the effect on the prevalence of HAD is uncertain . Furthermore, 95% of the world's HIV/AIDS patients reside in third world nations where HAART is prohibitively expensive and plagued by barriers to distribution. We have focused our attention on the potential therapeutic capacity of inexpensive, readily available, non-toxic reductants such as ascorbate (vitamin C). Post-mortem studies of patients with HAD have revealed decreased ascorbate levels in homogenates of the frontal cortex . In a model of septic encephalopathy, our studies with rat astrocytes have demonstrated a protective effect of intracellular ascorbate against iNOS upregulation following exposure to bacterial endotoxin lipopolysaccaride (LPS) and interferon-gamma (IFN-γ) . We report that iNOS upregulation accompanies neuronal injury and astrocytic hypertrophy in primary human CNS cultures following gp120 exposure. Furthermore, treatment of cultures with ascorbate-2-O-phosphate (Asc-p) prior to exposure to gp120 attenuates the upregulation of iNOS and protects against neuronal and astrocytic injuries. Biotinylated secondary antibodies; Avidin-Biotin complex; and fluorescein isothiocyanate (FITC) conjugated horse anti-mouse (F1-2000) were from Vector Laboratories (Chicago, IL, USA). Texas Red conjugated goat anti-rabbit (111-075-144) was purchased from Jackson ImmunoResearch (West Grove, PA, USA). Polyclonal anti-iNOS antibodies were purchased from Chemicon (Mississauga, ON, Canada). Polyclonal anti-caspase-3 antibody (6734A1) was from PharMingen (San Diego, CA, USA). Antibodies to glial fibrillary acidic protein (GFAP, polyclonal) and microtubule associated protein 2 (MAP2, monoclonal); ascorbate-2-O-phosphate (A-8960); poly-ornithine (C7518); anhydrous citric acid (C2404); 3,3'-diaminobenzidine, DAB (D4293); LPS (L2880); and phosphate buffered saline (P3813) were purchased from Sigma Chemical Company (St Louis, MO, USA). Monoclonal anti-CD68 antibody was from Dako (Mississauga, ON, Canada). Fetal bovine serum (16000-036); penicillin-streptomycin solution (P-0781); Dulbecco's Modified Eagle Medium, DMEM (10566-016); and laminin (23017-015) were from Gibco laboratories (Burlington, ON, Canada). IFNg (407304) was from Calbiochem (La Jolla, CA, USA). Neural progenitor base media (NPBM) and supplement (CC-3209) was from Bio Whittaker (Walkersville, MD, USA). HIV-1SF2 gp120 was obtained through the NIH AIDS Research and Reference Reagent Program, Division of AIDS, NIAID, NIH: from Chiron Corporation. The cultures used for these studies are based on previously described protocols of Pulliam  and Hammond. , which allow for primary human CNS cultures to be maintained for periods as long as one month as mixed aggregates. Furthermore, this technique resulted in cultures with a high degree of neuronal differentiation. The University of Western Ontario Ethics Review Committee approved the research protocols. Primary human CNS cultures were prepared as previously described. from 16–18 week gestational age fetal forebrain, which was transported in ice cold transport media (DMEM with 5% penicillin-streptomycin and 5% fetal bovine serum). The tissue was dissected, separated from meninges and triturated to a single cell suspension in fresh antibiotic and serum supplemented DMEM, centrifuged and resuspended in NPBM. Cultures were maintained as monolayers at a density of 5 × 105 cells/cm2 on poly-ornithine and laminin coated slides for confocal scanning laser microscopy (CSLM) studies or as free-floating aggregates in uncoated flasks at a density of 5 × 106 cells/ml for all other experiments. The cultures were fed biweekly by half media exchange and were incubated in a 37°C humidified chamber at 5% CO2 for four weeks prior to exposure to antioxidants and gp120. The cultures were then exposed to 1 nM gp120 for 24 hours. Paired cultures were pre-treated with media supplemented with 400 μM Asc-p or with media alone for 18 hours prior to gp120 exposure in the continued presence of Asc-p . Asc-p was used in place of ascorbic acid because of greater stability in culture medium. It has been demonstrated that cell culture media can catalyze the oxidation of compounds including ascorbate as reviewed by Halliwell. , resulting in cellular effects attributable to the oxidation products. Asc-p is taken in by the cells and converted to ascorbate intracellularly thereby avoiding this potential confounder. Cultures were run in triplicate. Prior to incubation with the cells, neither DMEM nor NPBM contained detectable ascorbate when assayed by high performance liquid chromatography (HPLC) with electrochemical detection . To ensure that preincubation with Asc-p alone does not cause iNOS upregulation, duplicate subsets of one culture were exposed to increasing concentrations of Asc-p for 18 hours and were then fixed prior to immunohistochemistry for iNOS. The concentrations of Asc-p examined were; 200 μM, 400 μM, 800 μM, 2000 μM and 4000 μM. In order to confirm the specificity of the iNOS primary antibody, immunohistochemistry was performed on iNOS knockout mouse astrocyte cultures. The University of Western Ontario Animal Ethics Review Committee approved the procedures. C57BL/6 wildtype mice and iNOS knockout mice  were purchased from Jackson Laboratory (Bar Harbor, ME, USA). The iNOS knockout mice were backcrossed onto the C57BL/6 strain for 10 generations to obtain congenic knockout mice. One-day-old mice were used as tissue donors. Primary cultures of cerebral astrocytes were prepared as previously described . Briefly, the areas superficial to the lateral ventricles of the cerebral hemispheres of 10 brains were dissected and the meninges were removed. The neopalliums were placed in 6 ml of MEM, minced with scissors and washed 3 times in MEM. The tissue was then triturated using a 10 ml serological pipette, vortexed and passed twice through nylon sieves (pore size of 10 μm). Modified Eagle Medium supplemented with horse serum (20%) was used to dilute the cell suspension (12 ml for each mouse neopallium). Three millilitres of the diluted suspension was distributed to each 60 mm culture dish and was incubated at 37°C in 5% CO2. The media was replaced every four days with MEM supplemented with 10% horse serum. The monolayer cultures grew to confluence within two weeks and were then used for experiments. Both monolayer and aggregate cultures were fixed in 4% paraformaldehyde in PBS for 30 minutes at room temperature. Fixed aggregates were suspended in 2.5% agar, and embedded in paraffin. After deparaffinization, rehydration and PBS rinses, 5 μm sections were incubated at room temperature in 3% hydrogen peroxide to quench endogenous peroxidase activity. Immunohistochemistry for iNOS in paraffin sections required antigen retrieval to adequately expose antigenic sites. Briefly, slides were boiled for 11 minutes in a citrate buffer in a 1100W microwave (GoldStar, MS-104YC) on high, followed by 11 minutes on medium. The citrate buffer consisted of 2.1 g anhydrous citric acid dissolved in 900 ml distilled water with its pH adjusted to 6.0. Following three 5-minute washes in PBS, slides were incubated in antibody diluent composed of PBS containing 5% serum and 1% Triton X-100 for 30 minutes. Sections were incubated with primary antibodies dissolved in antibody diluent for 2 hours at room temperature. In the case of iNOS detection, this incubation proceeded overnight at 4°C. Antibody dilutions were as follows: iNOS (polyclonal) at 1:250, GFAP (polyclonal) at 1:1000, MAP2 (monoclonal) at 1:500, CD68 (monoclonal) at 1:5000 and caspase-3 (polyclonal) at 1:500. Three 5-minute PBS washes followed incubation with the primary antibodies. Secondary antibodies were applied at a dilution of 1:200 in the antibody diluent for one half hour. Following another wash with PBS, Avidin-biotin complex was applied for one half hour before washing with PBS. Diaminobenzidine (DAB) was applied for 5–10 minutes followed by washing with PBS. Sections were counterstained with hematoxylin in some cases, before being dehydrated and mounted using Permount (Xylene based mounting medium). Negative controls underwent the same procedure, but without the primary antibody. Monolayers were processed for immunohistochemistry in a similar fashion. Following fixation, monolayers were washed three times with PBS and incubated in 3% hydrogen peroxide to quench endogenous peroxidase activity before being incubated in the above mentioned antibody diluent for 30 minutes. Cultures were then incubated for 2 hours with primary antibody dissolved in antibody diluent. The primary antibody dilutions for the monolayers were the same as those used for the paraffin embedded aggregate sections. Monolayers were then washed in PBS, incubated with secondary antibodies, Avidin-biotin complex, and DAB as done with the paraffin embedded sections. Following DAB incubation, monolayers were rinsed in PBS and coverslipped with glass coverslips and fluorescence-preserving mounting media. Monolayers were fixed for 30 minutes in 4% paraformaldehyde. Following three 5-minute washes with PBS, the cells were blocked for 15 minutes in antibody diluent. Cultures were incubated for 2 hours with primary antibodies in antibody diluent. MAP2 (monoclonal) was diluted 1:500, GFAP (monoclonal) 1:100, and iNOS (polyclonal) 1:250 dilution. Following washing with PBS, the monolayers were incubated in the dark for half an hour with Texas Red conjugated goat anti-rabbit and fluorescein isothiocyanate (FITC) conjugated horse anti-mouse each diluted 1:200 in antibody diluent. Following a final PBS wash, the monolayers were mounted directly onto glass slides with fade resistant mounting media. Slides were imaged on a Zeiss LSM 410 equipped with a Krypton/Argon laser, dichroic beam splitters and barrier emission filters needed for triple labelling. Texas Red was excited at a wavelength of 568 nm and collected through a long pass filter (590LP). FITC was excited with a wavelength of 488 nm and collected with a narrow band filter (515-540BP). Texas Red and FITC were assigned to the red and green channels respectively of the generated RGB image. To determine the amount of ascorbate accumulated by the cells following Asc-p preincubation, three wells of one culture were treated with 400 μM Asc-p supplemented media for 18 hours and three additional wells were treated with media alone. Following 18 hours, supernatant was removed, the cellular fraction was homogenized using a Mini-beadbeater (BIO SPEC products) and the intracellular ascorbate concentration was measured using high-performance liquid chromatography (HPLC) . Intracellular ascorbate was expressed per mg cell protein, which was measured by the Lowry method. Digital images from ten random high power fields were collected from each condition. The nuclei were counted manually and the average number of nuclei per field was calculated for each condition. There was no significant difference in cell density between conditions. Serial sections were subsequently stained for MAP2 or GFAP without counterstaining. Digital images were collected from ten random high power fields for each antigen from each condition. Images were converted to greyscale and SigmaScan Pro 5 software was used to establish an intensity threshold to quantify the total number of MAP2 and GFAP positive pixels. For image analysis of iNOS expression, counterstained slides were first thresholded to eliminate hematoxylin counterstaining after which images were analyzed as for MAP2 and GFAP. The average area stained per condition per field was calculated for the iNOS, MAP2 and GFAP stained sets. In the case of caspase-3 stained sets, the number of caspase-3 positive cells and the number of nuclei in each field were counted manually. Statistical analysis of these data was accomplished by one-way ANOVA using StatView software followed by a Fisher's Protected Least Significant Difference post-hoc test. A p-value less than 0.05 was considered significant. The concentration of gp120 to use for experimentation was determined initially by performing a dose curve experiment using primary human CNS aggregate cultures incubated with 0 nM, 1 nM, 10 nM, and 100 nM gp120 for 24 hours. The density and distribution of iNOS staining increased with increasing gp120 dose (data not shown). Nuclear fragmentation and condensation became apparent at 100 nM gp120. The 1 nM concentration was selected for further investigation because it represented the lowest concentration of gp120 to elicit a detectable upregulation of iNOS. Intracellular ascorbate concentration of the aggregate cultures was 30 +/- 11 nmol/mg protein in cells that had been incubated with 400 μM Asc-p for 18 hours. However, ascorbate was not detected in unsupplemented cells. Assuming the cells contain 4 μl water per mg protein, this intracellular ascorbate concentration approximates 8 mM. These levels of intracellular ascorbate are consistent with previous studies with rat . 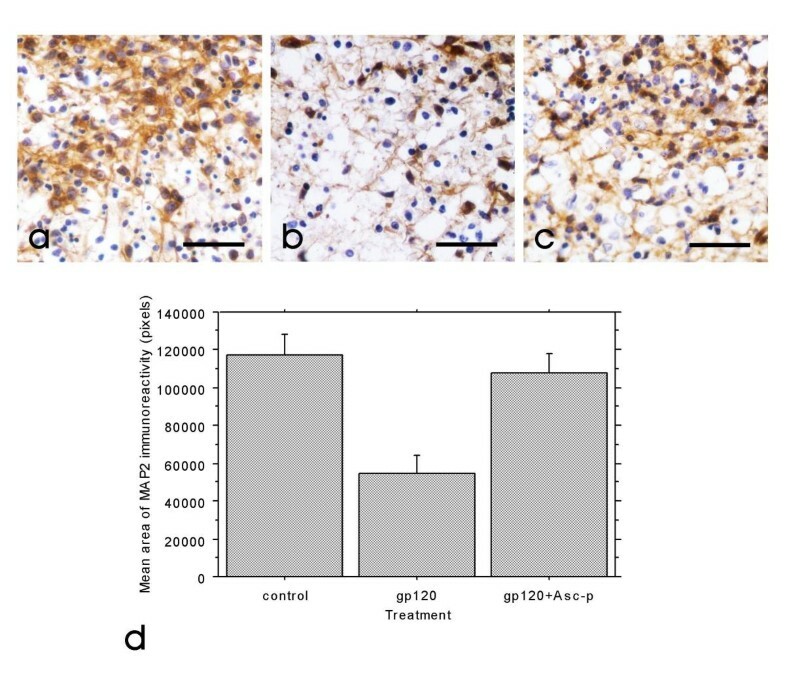 Following exposure to 1 nM gp120 for 24 hours, iNOS expression was markedly increased as detected by immunohistochemistry (figure 1a and 1b). In cultures pre-treated with Asc-p (400 μM), the increase in iNOS expression was greatly attenuated (figure 1c). Figure 1d is a quantitative assessment of the amount of iNOS immunoreactivity in each condition based on image analysis. iNOS upregulation following gp120 exposure was attenuated by Asc-p supplementation. 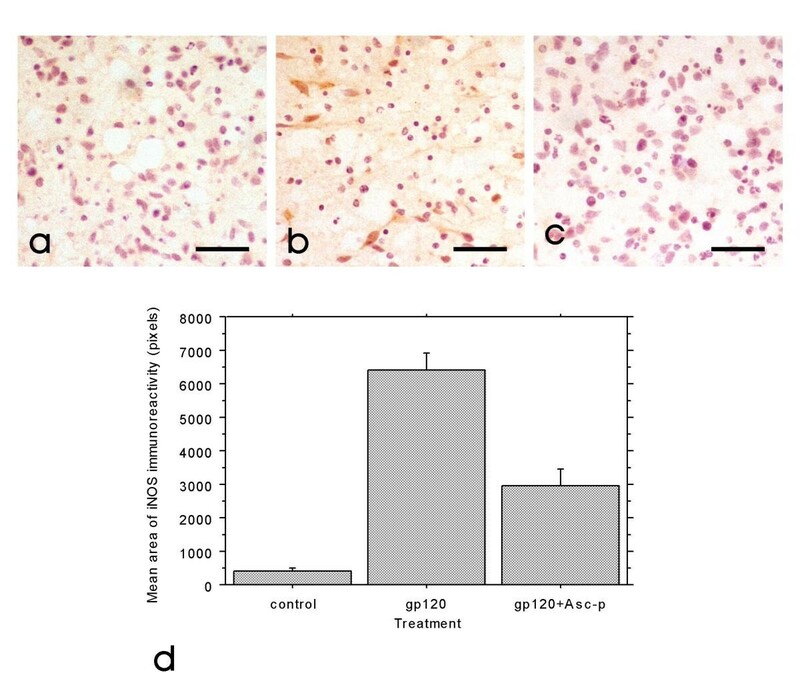 Representative images of control (a), gp120 exposed (b)and gp120 exposed primary mixed human CNS aggregate cultures at 4 weeks in vitro after Asc-p supplementation (c) demonstrate that Asc-p supplementation reduced iNOS upregulation. The cultures were examined by immunohistochemistry for iNOS expression (brown) with a hematoxylin counterstain (blue) for nuclei. (Bar= 40 μm). Quantitative analysis of ten random fields taken from each of the three treatment groups from one culture (d) corroborated the qualitative trend and showed the means of control and Asc-p supplemented groups to be significantly different from cultures treated with gp120. Control and gp120 treated group means were significantly different at p < 0.0001, the means of the gp120 and gp120+Asc-p groups were significantly different at p < 0.0001, and the means of control and gp120+Asc-p supplemented groups were significantly different (p = 0.0001). Error bars: +/- 1 standard error. Parallel aggregate cultures exposed to 1 nM gp120, 1 nM gp120 following Asc-p supplementation, or media alone for 24 hours were labelled for MAP2 or GFAP. Substantial astrocytic hypertrophy (as measured by GFAP immunoreactivity) occurred following exposure to gp120 (figure 2a and 2b), and this was averted by Asc-p pre-treatment (figure 2c). In addition, figure 3a and 3b demonstrate the reduction in neuronal process complexity following gp120 exposure (MAP2 staining). In the cultures pre-treated with Asc-p prior to gp120 exposure, MAP2 expression was preserved (figure 3c). Figures 2d and 3d are graphical representations of these trends based on image analysis of ten random fields in each condition from one culture subset. 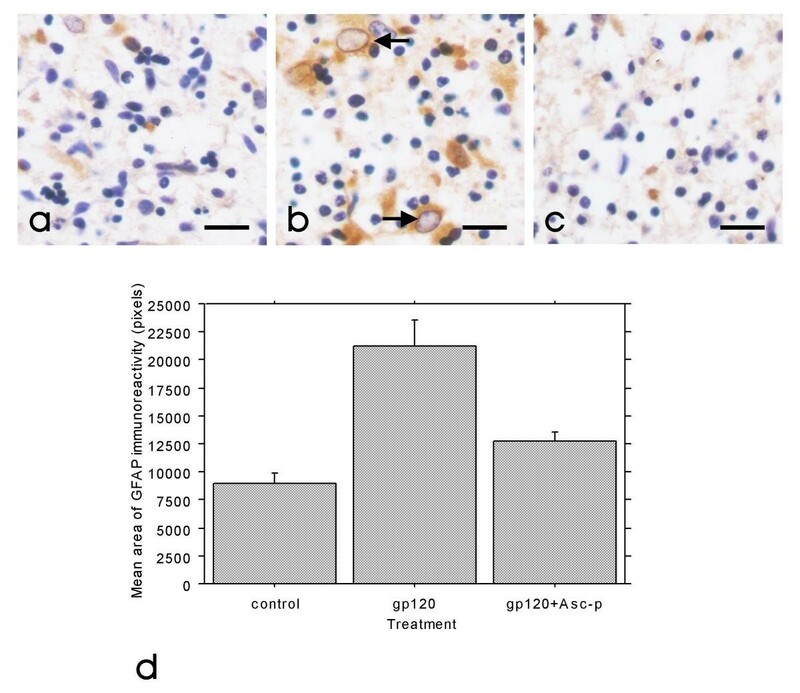 In contrast to astrocytes, microglia did not change in number or size following exposure to gp120, as detected by immunohistochemistry with CD68. Asc-p alone did not induce any structural injury or iNOS upregulation in the cultures. Astrocytic hypertrophy following gp120 exposure was prevented by Asc-p supplementation. Representative images of control (a), gp120 exposed(b) and gp120 exposed primary mixed human CNS aggregate cultures at 4 weeks in vitro after Asc-p supplementation (c) demonstrate that Asc-p supplementation prevented astrocytic hypertrophy. The cultures were examined by immunohistochemistry for increased GFAP expression (brown) indicative of astrocytic hypertrophy (arrows) with a hematoxylin counterstain (blue) for nuclei. (Bar= 20 μm). Quantitative analysis of ten random fields taken from each of the three treatment groups from one culture (d) corroborated the qualitative trend. Control and gp120 treated group means were significantly different at p < 0.0001, the means of the gp120 and gp120+Asc-p groups were significantly different at p = 0.0005 while the control and gp120+Asc-p treated group means were not significantly different (p = 0.0879). Error bars: +/- 1 standard error. Neuronal dendritic injury following gp120 exposure was prevented by Asc-p supplementation. Representative images of control (a), gp120 exposed (b) and gp120 exposed primary mixed human CNS aggregate cultures at 4 weeks in vitro after Asc-p supplementation (c) demonstrate that Asc-p supplementation protected neuronal MAP2 expression dendrites. The cultures were examined by immunohistochemistry for decreased MAP2 expression (brown) indicating the loss of synaptic complexity with a hematoxylin counterstain (blue) for nuclei. (Bar = 40 μm). Quantitative analysis of ten random fields taken from each of the three treatment groups from one culture (d) corroborated the qualitative trend. Control and gp120 treated group means were significantly different at p = 0.0002, the means of the gp120 and gp120+Asc-p groups were significantly different at p = 0.0012. However the control and gp120+Asc-p treated group means were not significantly different (p = 0.5052). Error bars: +/- 1 standard error. Wildtype and iNOS knockout mouse monolayer astrocytes were treated with the bacterial endotoxin lipopolysaccharide (LPS, 25 ng/ml) and interferon gamma (IFN-γ, 100 U/ml), or with vehicle, for 24 hours. Treatment of wild type astrocytes with LPS+IFN-γ resulted in a marked upregulation of iNOS as detected by immunohistochemistry (figure 4e) compared to untreated wild type cultures (figure 4c). However, iNOS was not detected in either the untreated or treated iNOS knockout astrocytes (figure 4d and 4f), further supporting the specificity of the antibody [44, 45]. Specificity of primary iNOS antibody confirmed by immunohistochemistry. 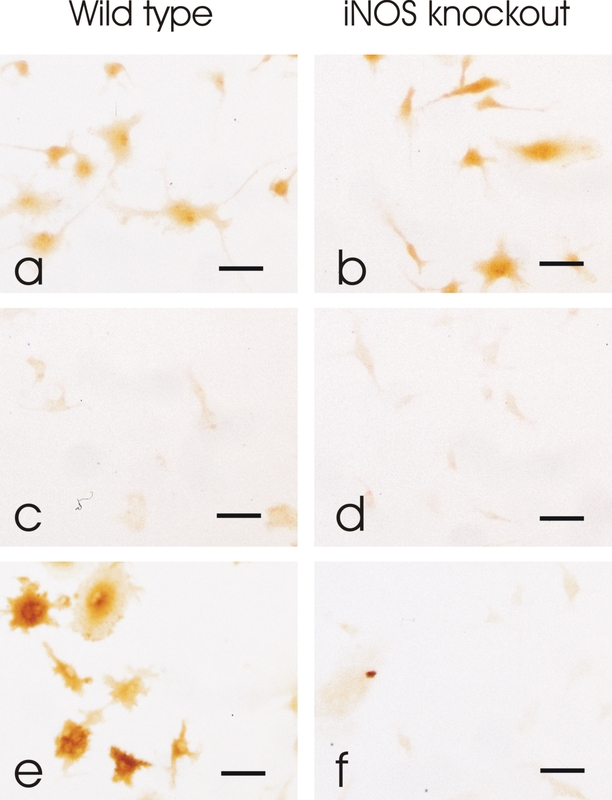 GFAP immunoreactivity was detected in both wild type (a) and iNOS knockout (b) mouse astrocyte monolayer cultures confirming the presence of astrocytes. iNOS immunoreactivity was not detected in wild type (c) or iNOS knockout (d) cultures treated with vehicle alone. In wild type cultures treated with LPS+IFN-γ, iNOS immunoreactivity increased (e). However iNOS was not detected in iNOS knockout cultures treated with LPS+IFN-γ (f). Bar= 20 μm. Confocal scanning laser microscopy was used to examine monolayer cultures for the source of iNOS upregulation. Almost all GFAP positive cells (astrocytes) co-expressed iNOS (figure 5, upper 3 panels). However, there were only rare examples of MAP2 positive cells (neurons) co-expressing iNOS (figure 5, lower 3 panels). Astrocytes were found to be the major source of iNOS expression. 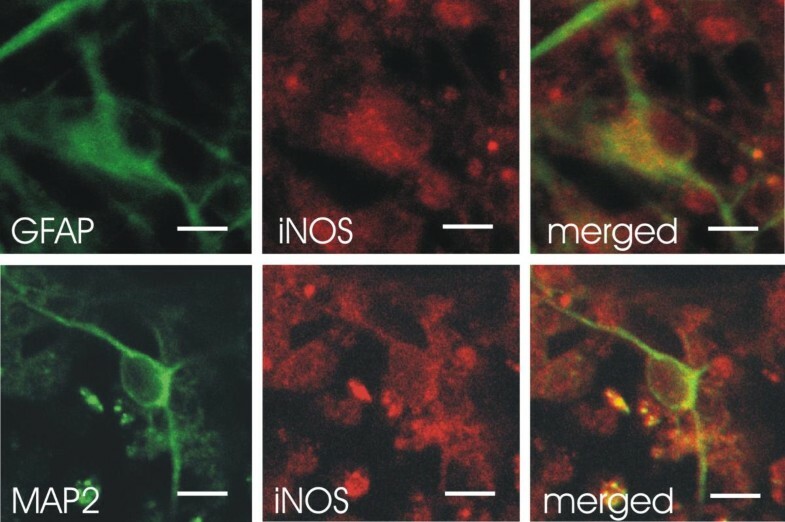 Confocal scanning laser microscopy studies of primary mixed human CNS monolayer cultures at 4 weeks in vitro revealed astrocytes to be the major sources of iNOS with rare neurons expressing iNOS. Immunofluorescence imaging by confocal microscopy was performed for detection of GFAP, MAP2 and iNOS antigens. Each panel of images shows individual fluorophores and merged fluorophores with colocalization represented in yellow. Gp120 exposed cultures show increased iNOS expression to colocalize extensively with the astrocytic marker GFAP (upper 3 panels) and rarely with the neuronal marker MAP2 (lower 3 panels). Bar = 10 μm. Aggregate cultures were stained for caspase-3 expression to identify the presence of apoptotic cells. Gp120, with or without Asc-p pre-treatment, had no detectable effect on caspase-3 expression (figure 6). This suggests that gp120 did not stimulate apoptosis during the 24-hour experimental period. Caspase 3 expression was not increased 24 hours after 1 nM gp120 exposure. There was no significant difference in the average percentage of caspase-3 positive cells per field in control aggregate cultures and those treated with 1 nM gp120 or 400 μM Asc-p prior to gp120 exposure. Ten random fields of each of the three treatment groups from one culture were used for quantitative analysis. Error bars: +/- 1 standard error. Our in vitro observations of neuroglial injury following gp120 exposure are reminiscent of post-mortem findings of HAD [46, 47]. This study is novel for the use of primary human mixed CNS culture to demonstrate the upregulation of iNOS in response to gp120 exposure and supports the previous findings of iNOS upregulation in human glial cultures exposed to gp120. . The expression of iNOS by microglia and astrocytes is well documented [49–51]. It has been demonstrated that astrocytic markers co-localize with iNOS in the setting of HIV-1 [34, 52]. Our co-localization studies using confocal microscopy also identified astrocytes as a major source of iNOS. The co-localization of MAP2 and iNOS, although rare, also implies that iNOS may be produced in select neurons. A recent study conducted by Hori et al., suggested that astrocytes were responsible for the dysregulated overproduction of NO from iNOS rather than monocyte-derived macrophages , but did not address neuronal iNOS production, which would presumably be additionally deleterious. Not only has neuronal expression of iNOS been identified in vitro and in animal models [54–56], but it has also been associated recently with other human neurodegenerative diseases. For instance, iNOS was upregulated in degenerated anterior horn neurons in the setting of amyotrophic lateral sclerosis. . In a study by Vodovotz et al., neurons with neurofibrillary tangles in affected brain regions in patients with Alzheimer disease, expressed iNOS . Moreover, cytokines known to induce iNOS have been shown to be elevated in the brains of patients with Alzheimer disease, along with an increase in nitrotyrosine staining indicative of the presence of excessive levels of NO or peroxynitrite . Although the presence of iNOS immunoreactivity in neurons has been demonstrated in Alzheimer disease , it has not been documented in the setting of HAD. Nitrosative and oxidative stress have been implicated in the pathogenesis of HAD and a number of other inflammatory and neurodegenerative conditions such as Alzheimer disease, amyotrophic lateral sclerosis, and Parkinson disease [61–63]. In such diseases, cellular damage can be attributed to the nitrosation or oxidation of vital cellular components such as lipids, proteins and DNA by reactive nitrogen and oxygen species (RNS and ROS). Relevant defence mechanisms include the scavenging of RNS and ROS and their precursors, binding of metal ions needed for catalytic formation of ROS, and up-regulation of endogenous defences . The role of the reductant ascorbate includes the regeneration of vitamin E from its radical and inhibition of the peroxidation of membrane phospholipids . Evidence has been presented to suggest that brain ascorbate levels are decreased in the setting of HAD . In addition to causing cellular damage directly, ROS have also been implicated as being key intermediates in signalling cascades under both normal and aberrant cellular conditions. Hydrogen peroxide has been demonstrated to be involved in several signal transduction pathways, stimulate mitogenesis, endothelial migration and capillary tube formation, and has also been demonstrated to enhance cellular survival at low concentrations as reviewed by Stone and Collins . In addition, of relevance to this research, studies have shown that endothelial NOS is activated by hydrogen peroxide through defined pathways [67–69]. Inducible NOS upregulation occurs in a wide range of neurological disorders [70, 71] and conditions including sepsis, Alzheimer dementia. , Parkinson disease , and in response to traumatic brain injury. . Both iNOS mRNA and protein were increased in the brains of AIDS patients that died with severe dementia compared to those with less severe dementia or no dementia at all . These in vivo observations correlate with our in vitro model of HAD in which iNOS was upregulated in cultures treated with gp120. Our understanding of the mechanism of neuroglial injury in this setting and the factors involved remains unfinished [76–81]. The present study implicates a role for iNOS and ROS. There have been no previous studies that have demonstrated the protective capacity of ascorbate in the setting of HIV-1 gp120 induced neurotoxicity and iNOS upregulation. This study establishes the ability of intracellular ascorbate to attenuate the upregulation of iNOS associated with gp120 exposure and the capacity of intracellular ascorbate to prevent gp120 induced astrocytic hypertrophy and neuronal dendritic injury. It is worth noting that others have demonstrated that ascorbate increased nitrite and nitrate production in a mouse macrophage-like cell line activated with LPS and IFN-γ . However, ascorbate alone exhibited no inductive activity in the iNOS pathway. In our own experience with human and murine CNS culture models of inflammation and sepsis ascorbate supplementation has been consistently associated with decreased iNOS expression [38, 83]. The exact mechanism by which ascorbate is able to reduce the upregulation of iNOS is unknown. A recent study by Wu et al. using rat microvascular endothelial cell cultures demonstrated that inhibition of iNOS induction by intracellular ascorbate was attributable to the reduction of intracellular oxidant stress, associated with attenuation of interferon regulatory factor-1 (IRF-1) activation . Interferon regulatory factor-1 and NFκB are transcription factors with binding sites in the promotor region of the rat iNOS gene. [84, 85]. However, Wu et al. showed that ascorbate had no effect of on LPS and LPS+IFN-γ induced activation of NFκB . Moreover, in cultured RAW 264.7 monocyte/macrophages, antioxidants were able to blunt the DNA binding activity of IRF-1, which mediates iNOS induction by LPS and IFN-γ . Additional studies have demonstrated a strong association between NFκB activation and iNOS upregulation [87–93]. The neuroprotective capacity of antioxidant drugs in the setting of neurodegenerative disease has been both encouraging and variable. In the case of AIDS related dementia, the antioxidant thiol thioctic acid (α-lipoic acid) was not successful. However, deprenyl was effective in improving cognitive function . The exact mechanism by which deprenyl protects cognitive function is not known but this monoamine oxidase-B inhibitor has been demonstrated to scavenge hydroxyl and peroxyl radicals  and increase the activities of the antioxidant enzymes superoxide dismutase and catalase [95–97]. No previous studies have addressed the protective capacity of ascorbate in a human in vitro model of HAD. We feel that it is important to explore the capacity of inexpensive, non-toxic and more accessible therapeutic agents for all patients with HIV-1/AIDS but especially for the vast majority of patients that cannot afford antiretroviral therapy. We have demonstrated that intracellular ascorbate attenuates the upregulation of iNOS, as well as the reduction in dendritic complexity and astrocytic hypertrophy associated with gp120 exposure. The effectiveness of ascorbate in the prevention and treatment of HAD awaits further study in a clinical setting. The present studies demonstrate that ascorbate supplementation is able to prevent the deleterious upregulation of iNOS and associated neuronal and astrocytic protein expression and structural changes caused by gp120 in primary human CNS cultures. Ascorbate is a safe, readily available and inexpensive antioxidant and is therefore potentially beneficial to all patients, especially those in impoverished countries. We recognize that our research is in vitro and that further studies are needed to confirm the findings and explore the mechanisms underlying the phenomenon. The authors wish to thank Ewa Jaworski, Kris Milne, Stephanie Totten, and Dr. Fraser Fellows for their technical and clinical contributions. JXW was supported by the Natural Sciences and Engineering Research Council of Canada. RH was supported by the Ontario HIV Treatment Network. RH conceived of the study. KW designed and carried out the experiments and collected and analyzed the data in the laboratory of RH. RH, JM and JXW aided in experimental design and analysis of results and co-wrote the manuscript with KW. JC performed preliminary immunohistochemistry and assisted with confocal microscopy. VEL established and provided the knockout mice and tissue used in these studies and provided advice. All authors read and approved the final manuscript.